Dimuth Karunaratne has been appointed as the captain of the Sri Lankan Cricket Team earlier today. The left-hander last played an ODI for his country in ICC Cricket World Cup 2015. Captaincy has been a major issue for the struggling Sri Lankan cricket team in the last couple of years. 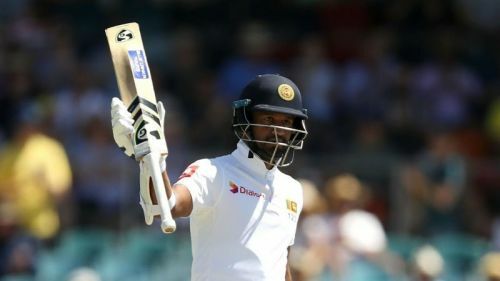 The likes of Lasith Malinga, Angelo Mathews, Dinesh Chandimal and Thisara Perera have led the team in recent times but none of them managed to hold on to the position. With discussions going on as to who should lead them at the World Cup, the Sri Lankan Cricket Board has made a surprising choice with Dimuth Karunaratne's appointment as the captain. After the retirement of the legends of Sri Lankan cricket, the teams' major achievement so far has been the historic clean sweep of the South African team in South Africa held this year. The memorable Test series had Dimuth Karunaratne in charge as the captain who helped his team achieve the unthinkable. The 30-year-old also had a decent impact with the bat in the series. With no clarity as to who would take the mantle in ODI cricket, Sri Lanka has gone ahead with Dimuth Karunaratne as their captain based on his exploits in the 5-day format. However, the decision seems unconventional as the player last played an ODI for his team 4 years ago at the World Cup which was held Down Under. Also, the left-hander does not have a great record in the 50-over format scoring just 190 runs in the 17 ODIs he has played so far. Sri Lanka is yet to announce their squad for the World Cup which is set to start in May this year. Having been in disappointing form since the previous World Cup, the Lankan team will look to make amends by putting on a good performance in the upcoming edition.